Newhope Law, PC is a boutique intellectual property law firm providing legal representaion regarding patents (protecting inventions), trademarks (protecting company names and logos), trade dress and copyrights (protecting artistic expression). The firm also files reexamination requests to challenge patent validity as well as represent both plaintiffs and defendants in US District Court﻿ litigation. 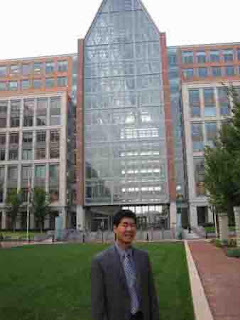 Clement Cheng, Esq. in front of United States Patent and Trademark Office in Arlington Virginia after oral arguments at the Trademark Trial and Appeal Board. Clement Cheng graduated from UCLA with a bachelors of science in Mechanical Engineering then graduated from Loyola Law School of Los Angeles in 1998. In school, Mr. Cheng was an editor at the Loyola Law School International Law Review and published a paper on comparative campaign finance regulation in Taiwan and Canada. He also volunteered at the Asian Pacific American Legal Center and the Western Law Center for Disability Rights. After law school, he worked for James Lundquist, a real estate law firm. Today, Mr. Cheng runs Newhope Law, PC, an intellectual property law office in Orange County handling intellectual property litigation in federal court; patent prosecution, trademark prosecution, and Trademark Trial and Appeal Board matters. Occasionally, he files Canadian trademarks, handles United States customs matters and files patent re-examination requests. He is fluent in Mandarin, but his Japanese needs work before he can take the level 4 JPT. Mr. Cheng is a registered patent attorney with the United States Patent Office and is a member of the California bar and Washington DC bar. The office system thus applies the Toyota Production System philosophy of decreasing waste (無駄). The office system is routinely reviewed for ways to decrease waste. The office system uses up to date electronic calendaring, and electronic document capabilities so that clients receive legal files electronically and in more organized fashion than a traditional paper file. Patent and Trademark office documents, court documents and litigation documents are scanned and filed electronically. Office procedures automatically provide a copy of a filing receipt to the client. The entire office file is backed up routinely. The office is networked on Gigabit Ethernet with PC’s running late versions of Windows so clients don't pay for down time. Attorneys using computer voice dictation save time dictating documents (up to 100 wpm) without dictation expense billed to the client. Using Exchange Server, all members of the office share the same calendar, and dockets maintaining an efficient operation connecting all members of the office. Even the Windows Server is efficient, the Intel Atom board using less than 20 Watts. Without efficiency, there can be no value because costs balloon out of control and litigation costs quickly go to seven digits. Just as the low cost of overseas labor makes manufacturing difficult for those who are less efficient, even the most educated, and most intelligent legal team can not win for their client without being efficient. Example #1 in American Mensa, Ltd. v. Inpharmatica, Ltd. et al., No. 07-3283 (D. Md filed Dec. 6, 2007) Mensa (the high IQ society) spent over a million dollars in Ferderal Court and lost, unable to stop the sales of AdMensa IQ enhancing product. Mensa was then forced to raid $600,000 from life membership funds. If the lawsuit had only cost about $100,000 by hiring a small firm for a TTAB action (limited to likelihood of confusion), there would have been little pain and still enough money to fight a dozen battles. By hiring the expensive attorneys, Mensa lost the war before it even started. Thus, in the long run, high intelligence and education are no match for creative efficiency since creative efficiency is what keeps costs under control. Clement Cheng supports Mensa as a life member and is greatly saddened by the financial losses. Example #2 scanning electronic discovery, OCR and using Google desktop to query key words shortens document review hours greatly. The old fashioned way doing 40hrs document review times $350/hr equals $14,000 can not win vs. the electronic automated method and less expensive attorney at 4hrs document review times $200/hr for $800. Especially since these bills come in every month in protracted litigation. Abstract: As Taiwan completes the democratization process, the Legislative Yuan must decide the future of money politics in Taiwan. As a guide to Taiwan's future legislation, the Legislative Yuan should examine campaign finance regulations in the United States and Canada. Volume 20, Loyola of Los Angeles, International and Comparative Law Journal (April 1998). Published by Joe Christiansen: Law Books Publisher. Feel free to email comments or request a hard copy for $10 to cover shipping and handling. (c) 2016 Newhope Law, PC . Simple theme. Theme images by gaffera. Powered by Blogger.